Three lovely ladies are hosting A Month of Faves again this December. Yay! I thought it was a great way last year to get some posts scheduled ahead of time and also to remind me what I loved most about my year and my life at the time. There are prompts for most weekdays and so I'm going to try and get as many posts up as possible! For some reason I am reading more books this year than I have in recent years. I have finished 123 so far and have a couple in progress at the moment. The past three years have literally been 105, 103, and 104. Talk about consistency! I think this year's spike is probably due to graphic novels but I'll take it. It feels super productive! I'm at 14 non-fictions right now for 2015 which is also making me feel super happy. In past years I've read 6, 6, and 4, so I've finally managed to reach my goal of averaging at least one per month. I really had to reevaluate which books would keep my interest. My most read authors are, predictably, Diana Wynne Jones, Terry Pratchett, and Bryan Lee O'Malley. 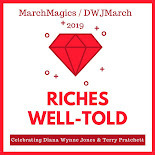 I wouldn't mind fitting one more Terry Pratchett in this year and I am already planning next year's DWJ March! Trish asked Andi and I yesterday why specifically we thought that we were neglecting our own books. I looked it up and, so far, I had read 59 books from home (new, TBR, and rereads) and 68 books that were either library books or ARCs. This seems crazy to me when I have a TBR of 160+ books. If I replaced those library books and ARCs with my own books, I would get rid of my TBR in less than two years. This is definitely a big reason why I will #readmyowndamnbooks in 2016. So, how has your reading year been so far? Do you have any goals for the last month of 2015? I am going to try and just pick up books that are already in my house and that seem like they will be fun reads! I have way too many goals for the last month of 2015. More than I can possibly finish them. AND on top of it I find myself re-reading books and ignoring all of them. Ha. So it goes. Still, I hope to at least finish most of the remaining to be reviewed pile for this year. That would be a good start. I need to do more of the rereading and ignoring. ;) Good luck on the reviews! I've had the opposite situation in that I believe this will be the fewest books I've read in a year since I started blogging nearly 11 years ago. Part of that is due to adding commitments to my life with church and social functions, and part is, honestly, that I've devoted more time to playing video games this year than I have in past years, so its been a trade off. But with the return of cold weather my desire to read always increases and I suspect I'll get a nice chunk of things read this month. Exactly. In a perfect world I would make time to read a little and play a little most days, but the reality is that the book I'm reading or game I'm playing ends up sucking me in and I couldn't bear stepping away from it to do the other. But of course there's a time limit for reading library books, whereas you can read your own books any time. So it makes sense to prioritize library books over books you own. This is part of my problem. I request all of the shiny new books from the library and then I rush to read them because I rarely return books unread. I need to be a little more aware in regards to my library requests! WHOA! 100+ is amazing. It makes my head spin in fact! I can never seem to break 70 or so. I think it helps that I read a lot of middle grade! My reading year's been good, and I'm trying to avoid setting too many goals for the month of December. I mainly just want to read what I'm in the mood for. More comics, I think! I think I want to read more comics in December! Way to go with the number of books read. And ooh what a nice long list of contenders for your faves!